College Station is not known for its food trailers, but there are a few that have made quite a name for themselves (Chef Tai from College Station was recently named The Texas Food Truck Champion (overall) winner at the Texas Food Truck Showdown) Another up and comer to the food truck scene is Derek Barre, owner and operator of Lew’s BBQ. Derek got into the food truck business in December of 2012 with a partner (named Lew), but soon found himself serving delicious smoked meats by himself. He kept the name, as it was good as any other. 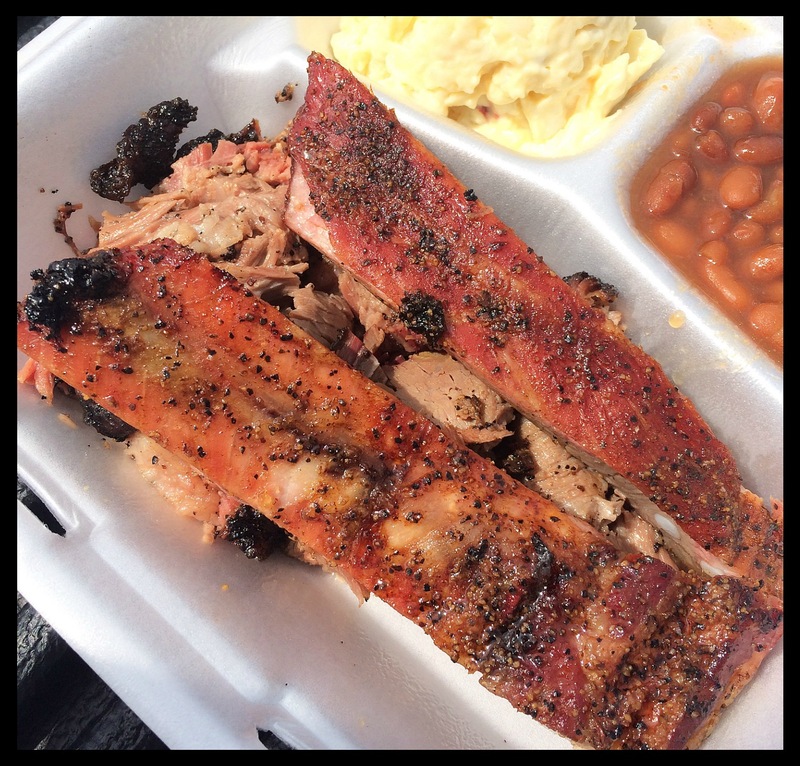 Lew’s BBQ trailer is located at 123 Walton Dr. in College Station, Texas. 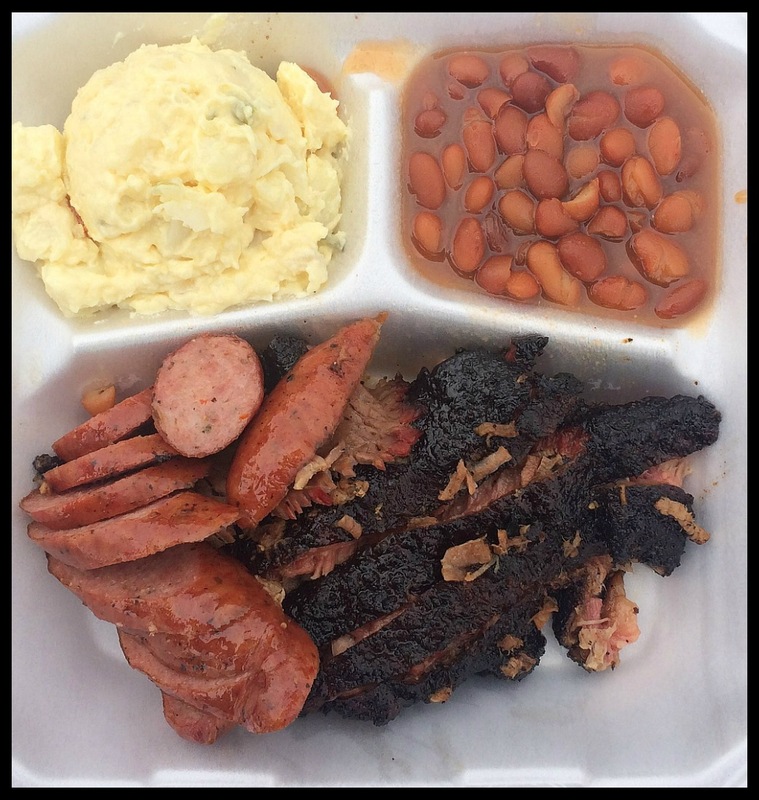 Lew’s BBQ trailer is located at 123 Walton Dr. in College Station, where it serves a lunch crowd from 11a-2p most days (follow him on Facebook to see if he will be open, and what the menu for the day will be). In addition to his lunch service, Derek is a regular at the New Republic Brewing on the second Friday and fourth Saturday of each month. He also has catering gigs and appears at special events. 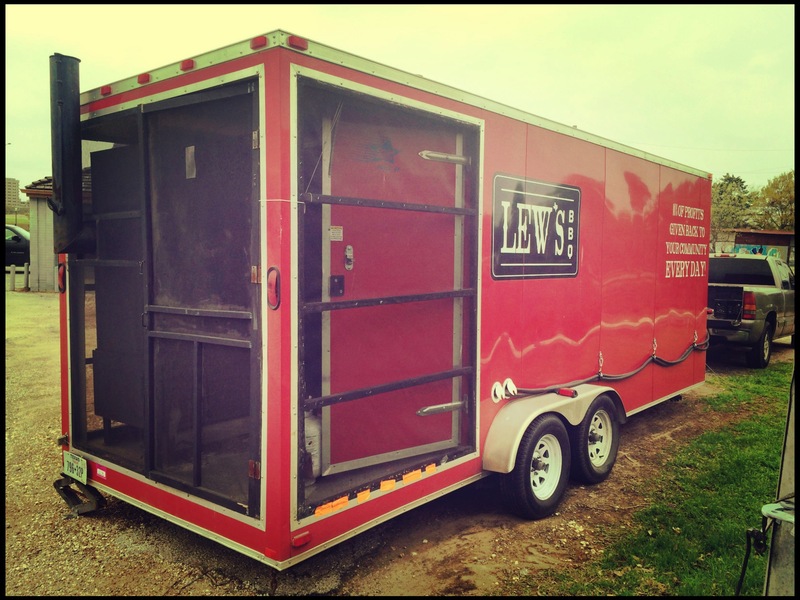 Lew’s BBQ trailer has an enclosed smoker at the rear, where all the cooking is done. The trailer is parked on the backside of a strip center with no seating (indoor nor outdoor) available (I would suggest using the landscaping stones bordering the adjacent park.) 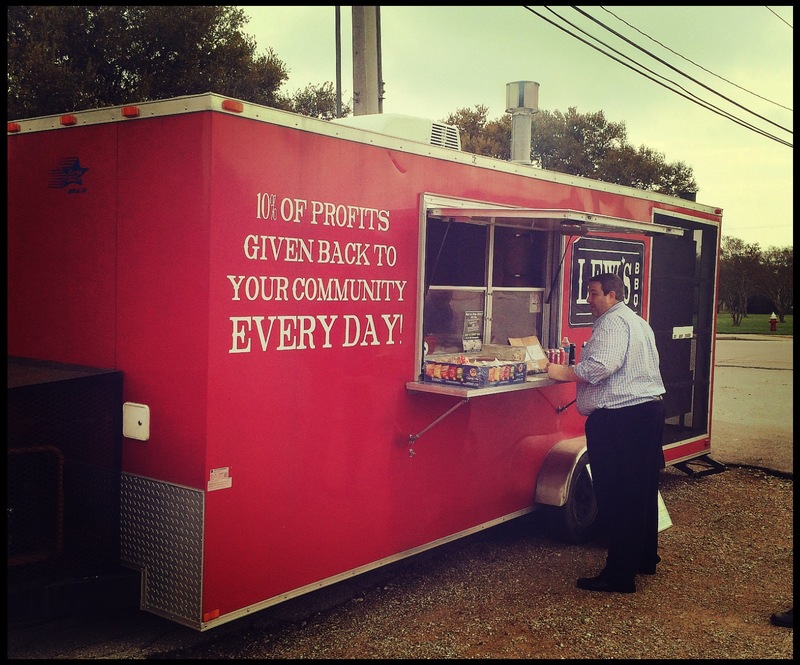 The trailer has an enclosed smoker on the backend, and Derek serves food from the window in the middle. It should be noted that Lew’s BBQ serves a rotating menu. This means that you can’t always get the Holy Trinity of smoked meats, as pork spare ribs is not a daily menu item (brisket IS!) Other menu items include peppercorn pork tenderloin, BBQ chicken quarters, garlic and pepper encrusted tri tip steak, as well as sausage and brisket. Other specialty items include smoked pineapple and barbacados (The Barbacado- a seasoned-smoked avocado half on a bed of BBQ beans, topped with your choice of meat and our BBQ salsa!) Additionally, fish tacos are served on Fridays during Lent. Derek smokes his briskets for up to 18 hours. That’s a crazy long time for most in the industry, who can turn a brisket in ~12 hours (Franklin BBQ averages 14 hours, and Stiles Switch BBQ & Brew averages 12 hours). The brisket has been inconsistently cooked over a few visits. On one occasion, the brisket was overcooked, but still very tasty. On two other occasions, the brisket was extremely tender and juicy, and packed with great flavor. Interestingly, the meat itself was infused with great flavor, not just the bark. This is the mark of a job well done! The bark, while tasty, was a bit chewy and difficult to eat, but well worth the effort. The smoke ring was thick, and the bark ample (if asked for!) This is some seriously good-looking brisket! Derek uses a rub on the brisket that is a bit different than most places. He uses salt and pepper, but then adds espresso powder and brown sugar. I don’t know if the meat really needs those two added ingredients, but they are detectable. All in all, if Derek can clean up the inconsistencies we’ve experienced, he promises to be in this business for a long time to come. The ribs at Lew’s BBQ are fantastic! Unfortunately, the ribs are not an everyday item on the menu. That is too bad, as they are exceptional! The only complaint was that they too have been somewhat inconsistent as to tenderness, but that is more a function of the placement of the exact rib tasted in the rack, or the specific rack in the smoker. Great ribs can be found right alongside so-so ribs in a rack, which makes flavor more important than tenderness when sampling ribs. Lew’s BBQ has consistently produced delicious ribs! I’m just sure that one of these days I’ll chance upon the perfect rib at Lew’s BBQ, and it will blow my socks off! Keep up the good work, Derek! Lew’s BBQ serves locally sourced sausages, made at Readfield Meats (a small meat market and deli in Bryan, Texas). His mainstay is the original “barbecue” sausage, but offers the jalapeno sausage on his rotating menu. The sausage is prepared well, and is of high quality, if not made in-house. The flavor is good, but not great, and even Derek admits that he serves the original because it appeals to a wider audience than the special offerings that he prefers. When you are a small operation I suppose you can’t offer a very wide selection – hence the rotating menu. When (not if) you go to Lew’s, be sure to order the sides. The barbecue beans are spectacular! I am a huge fan of baked beans, and Derek prepares his pinto beans in a similar fashion to baked, or “pork & beans” style. Additionally, the potato salad is also very good, giving a bit of a kick. But the side to pick is the smoked pineapple! 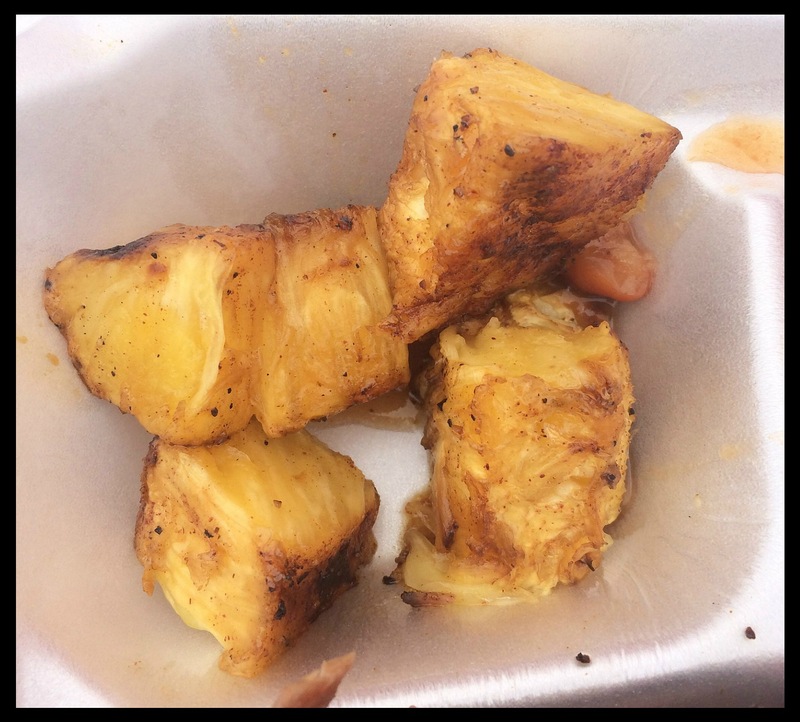 Lew’s BBQ prepares a smoked pineapple that is incredibly delicious! Amazing! Truly, I don’t know if Derek does anything more than just throw some pineapple on the smoker for a few minutes, but I give him credit just for coming up with the idea of doing so! It is SO good, and makes you feel better about yourself for having just eaten a pound of smoked protein! 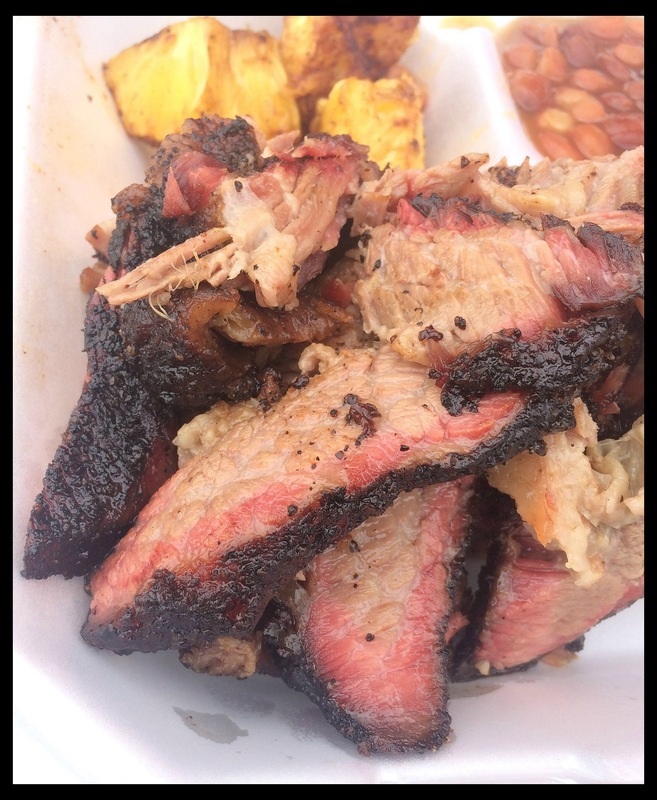 While Lew’s BBQ does not displace Kreuz Market as best in the Brazos Valley, it sure beats everyone else! This entry was tagged barbacado, barbecue, brisket, Food Trailer, Lew's BBQ, pork ribs, pork spare ribs, readfield meats, ribs, sausage, Texas BBQ. Bookmark the permalink.